With a range of international and local experience, we can help your organisation better meet the needs of your service users through teaching you creative, participatory consultation techniques or consulting with them on your behalf. Julia has evaluated a number of international projects that focus on inclusion and participation (including Afghanistan, Moldova, Colombia, Laos and Peru). A training day/half-day for staff that teaches them a range of strategies to involve children and young people in educational, transition and looked after reviews using person-centred techniques. We can research and report the views of your service users on current service provision and their hopes for future plans. 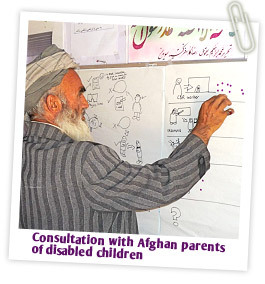 We specialise in gaining the views of children & adults from marginalized groups, using a range of creative and engaging techniques (including pre-prepared graphics, which feature in the reports). Julia is experienced in evaluating project outcomes and providing recommendations for UK-based and international organizations. She has a good reputation for using creative participatory techniques to engage beneficiaries and other stakeholders, and has worked with Ministry officials, trustees and managers, project staff, parents/carers and children in the UK and abroad (including Afghanistan, Moldova, Colombia, Laos and Peru).